Easy to implement, proven safe and requires no maintenance. Easiest and fastest fix to reduce energy cost. NSRT liquid coating generates a EVA Field (Electron Vibration Alignment Field) that can realign electron spin to create a more efficient flow of electrical current, thereby minimizing energy loss. The EVA Field created by NSRT coating aligns the vibration and movement of electrons in all matter so that their physical properties are fundamentally enhanced. Electricity is a flow of moving electrons. Electrons move freely and irregularly, with collisions from atom to atom, creating a flow, called the electric current. Free moving electrons are not optimized, often gives out irregular current. Condition of conductive wire used. The Energy losses through heat dissipation before reaching the “Load”. Energy Losses being reduced to the minimum with the Injection of an EVA field smoothening the flow of electrons to reduce energy loses across the cables & MDBs/SDBs. The key lies in the secret, with optimizing electron flow. No tampering/modification of your electrical meter wiring systems, and/or your building electrical distribution system. NSRT generates a frequency field which is able to penetrate plastic and metal surfaces up to a distance of 600 – 800mm, to realign electron spin (current) flowing through in the MDBs and SDBs. 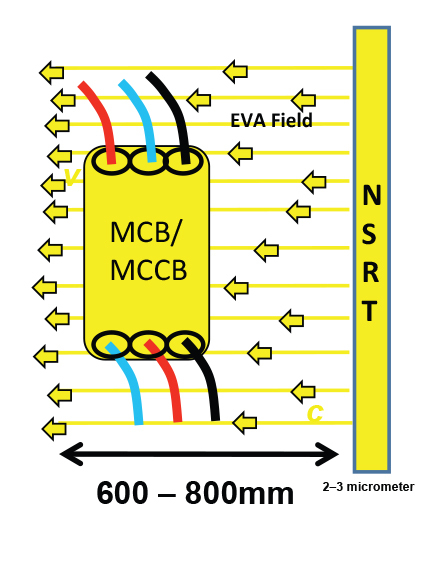 NSRT’s EVA Field will not affect the voltage potential in the electricity system after optimizing the current flow and reducing the current flow resistance in the electrical distribution system, thus not causing any malfunction to any type of equipment.